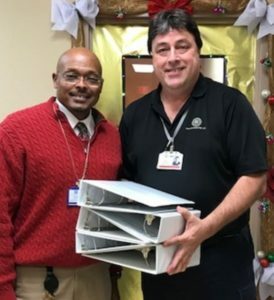 Resident file binders are an item that receive a lot of handling in any center, reports Regional Vice President Joe Driver (left). When eventually discarded in Del Rio, Resident Monitor Don Merkle (right) re-purposes them to children in need at the Especial School in Acuna, Mexico. For several years, Merkle and his family have supported the school, which includes students who have physical and mental health needs. With the binders, Merkle is able to assist the children who lack school supplies.